A few weeks back, we talked about Takers and Producers. Below is another example of what good can happen when we take action to eliminate pure giveaways in our society… to stop the enablement of the Takers. Deep down, it is our human nature to want to work and be productive. But, when Mom or Dad (the government), are handing you money and telling you, “There is more where that came from,” we can get lazy, and most of us do. Alabama isn’t just giving these away to anyone anymore, and hopefully they are starting a trend. Recently, 13 counties in Alabama have started to mandate work requirements of able-bodied people in order for them to receive their food stamps… look what happened. This is a fantastic requirement, and a little sad that we act as though we didn’t know these requirements would help in the first place. We all know how our children would turn out if we gave them everything they needed and they never had to work for anything themselves. Most would have an entitlement attitude, would not be that motivated, and would actually expect more, while wanting to do less. A human being is a human being. That is what they do. I am not necessarily a fan of Bill Clinton, but I must give credit where credit is due. His work with welfare reform was similar. During his administration, he required justification for welfare. In doing so, he dramatically reduced the number of people that were receiving it without good reason. It can be done. We need to believe in the people of this great nation. They can do it. If we really care, we can’t keep giving people excuses to not be productive. Let’s treat others just as we would treat our children, by believing in them and giving them the tools to prosper instead of giving them a handout. These 13 Counties Started Work Requirements for Food Stamps. Here’s What Happened. Signs like this in grocery stores advertise the Supplemental Nutrition Assistance Program, or SNAP, better known as food stamps. Participation in the food stamp program plunged by 85 percent in 13 counties in Alabama after officials required that recipients must work, look for work, or get approved job training, a state agency says. In those 13 counties, enrollment in food stamps dropped over four months from 5,538 able-bodied adults without dependents to 831 such recipients. Statewide, a total of 13,663 able-bodied adults without children or other dependents were enrolled in the food stamp program before the change implemented Jan. 1, according to the Alabama Department of Human Resources, the news site AL.com reported. As of May 1, that statewide number had dropped to 7,483, the agency said. “Based on the trend, the number of [able-bodied adults without dependents] recipients … is expected to continue to decline statewide and in the formerly 13 exempted counties,” agency spokesman John Hardy told AL.com. Thirteen of Alabama’s 67 counties—Greene, Hale, Perry, Dallas, Lowndes, Wilcox, Monroe, Conecuh, Clarke, Washington, Choctaw, Sumter, and Barbour—previously were exempt from enforcement of the federal work requirement for those participating in food stamps. That exemption ended as of Jan. 1 under the administration of Gov. Kay Ivey, a Republican. Because of reforms to the welfare program in 1996, able-bodied adults ages 18 to 49 without dependents are limited to three months of food stamp benefits without working in a 36-month period, unless they find employment or are involved in a work program part time. A state could waive the requirement in areas it can demonstrate have job shortages or higher unemployment rates than other areas. However, in 2009, with passage by Congress of the American Recovery and Reinvestment Act, the Obama administration allowed all states to waive the work requirements for food stamp enrollment. This expansion of waivers led to a dramatic increase in the number of able-bodied adults without dependents who went on food stamps, from 1.9 million in fiscal year 2008 to almost 4 million by fiscal year 2010, and 4.9 million by fiscal 2013. The huge decrease in food stamp participation in Alabama isn’t the first time that moving from welfare to workfare got big results. As previously reported by The Daily Signal, Maine Gov. Paul LePage, a Republican, enforced work requirements for food stamp recipients beginning in December 2014. Within three months, the number of those on food stamps who were able-bodied adults without dependents declined from 13,332 to 2,678, Maine officials said. Caseworkers in Maine attribute that huge decrease in enrollment to many recipients’ choosing to go without benefits rather than perform a minimum of six hours per week of community service, or other aspects of the work requirements. 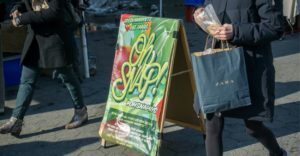 If the federal government establishes and enforces similar work requirements nationwide, total food stamp enrollment would plummet in a few years, possibly saving taxpayers $10 billion per year or as much as $100 billion over the next decade. That is the conclusion of Robert Rector, a senior research fellow at The Heritage Foundation who specializes in poverty and welfare programs. The federal government “should require constructive behavior” from able-bodied adults without dependents if they wish to get food stamps, Rector argues. That means requiring that they “take a job, prepare for work, perform community service, or at a minimum search for employment in exchange for aid and assistance at the taxpayers’ expense,” he and Heritage colleagues write. “They cannot be a way of life,” she added. The Heritage Foundation report last year by Rector, Rachel Sheffield, and Kevin Dayaratna argues that work requirements for welfare recipients produce eight types of positive results. Among them, work requirements ensure that welfare isn’t a one-way transaction; aid those who truly need help; decrease the number of people enrolled on food stamps; decrease the overall attractiveness of welfare; and save taxpayers money. The research paper notes that a Rasmussen survey in July 2012 found bipartisan support for work requirements among Americans, with only 7 percent opposed and 10 percent undecided.